I’ve always loved being out at night. Even when I was young...there’s something mysterious and magical about seeing the world after the sunlight has gone. 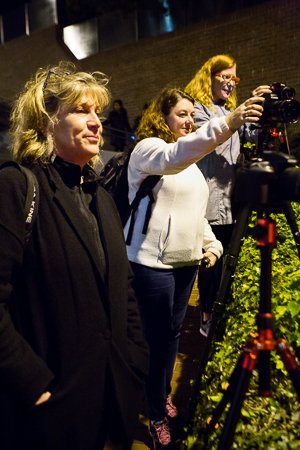 The advancement of digital photography has made exploring the world after dark a much more memorable experience in that we can now capture some of the feeling in our images. 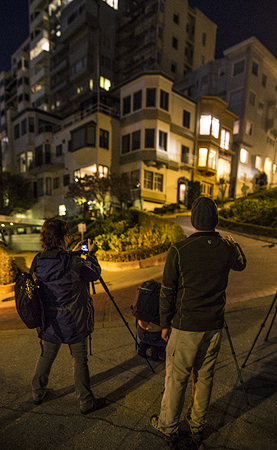 Scott Donschikowski and I met a group of 7- eager photographers for a night of exploration and education in San Francisco. After a brief orientation our group set out for the Palace of Fine Arts. This building is a beacon of cool architecture…which makes it a beacon for cool photography as well. 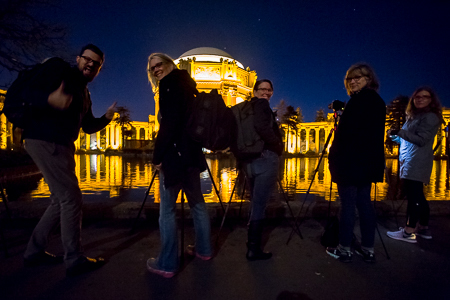 We had the group set up along the reflection pool across from the giant domed structure. Here we helped the group start to shift their thought process to long exposures, and the way those are used in creating stunning night images. The less light we have, the more time we need to spend exposing the sensor in order to achieve a nice exposure. 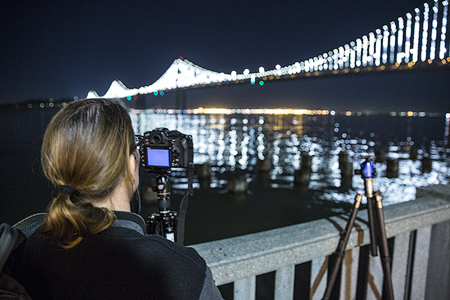 We’re also able to cover composition tips, white balance, and other things that help with our night work. The group was doing great and we saw all kinds of nice images on those tiny little screens. 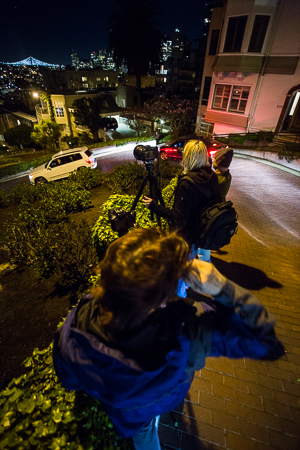 Our second stop was Lombard Street…here we’re able to photograph the twists and turns of this iconic one-way street as headlights and taillights streak their way down. We break the group up so half is shooting the taillights, and the other half is shooting headlights. There are slightly different techniques for each, but we are clearly focused on longer exposures again. The longer we leave our shutter open, the more lights from cars we will see streaking through the image. How many is the right amount? Well that’s up to the photographer and their personal tastes…it’s also up to how many cars are driving down the road at that time of night...and that seems to be an all or nothing condition! 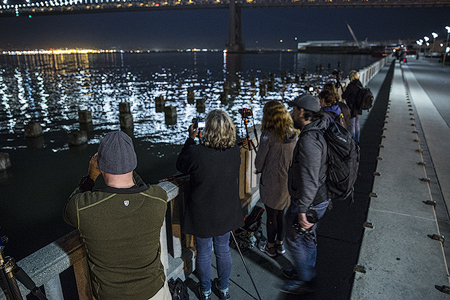 Once the group had shot taillights and headlights it was time to move on to Embarcadero, where we photographed the Bay Bridge from 2 different similar spots. Both spots had nice vistas of the bridge, and old pier pilings in the foreground. The only difference was the kind of light behind us illuminating the foreground…one light was LED and very cool, while the other was more Incandescent and warm…it gave the class a good lesson in how the type of light you are shooting can change the feel of a photo, and also the amount of processing you’ll need to do when you get to that part of the process. 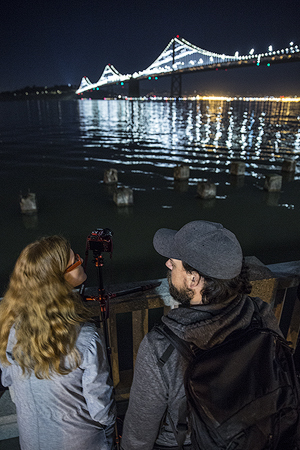 The final spot for our night out was Fort Baker fishing pier…this little slice of the city offers up a tremendous view of the Golden Gate Bridge…we love showing our groups some of these lesser known spots for such an iconic bridge. Here we concluded our night by just continuing to remind the class about the longer exposures, how those change with higher apertures…and reinforced our lessons in white balance and composition. 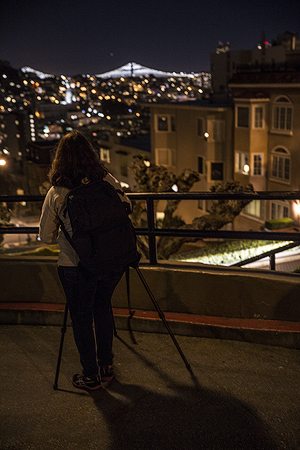 Night photography is pretty simple in its theory. Longer exposures brighten up the scene, and once you understand that headlights, and bright light bulbs will almost always over-expose, and you need not worry about them…you can set to really trying to get the rest of the image to look right. 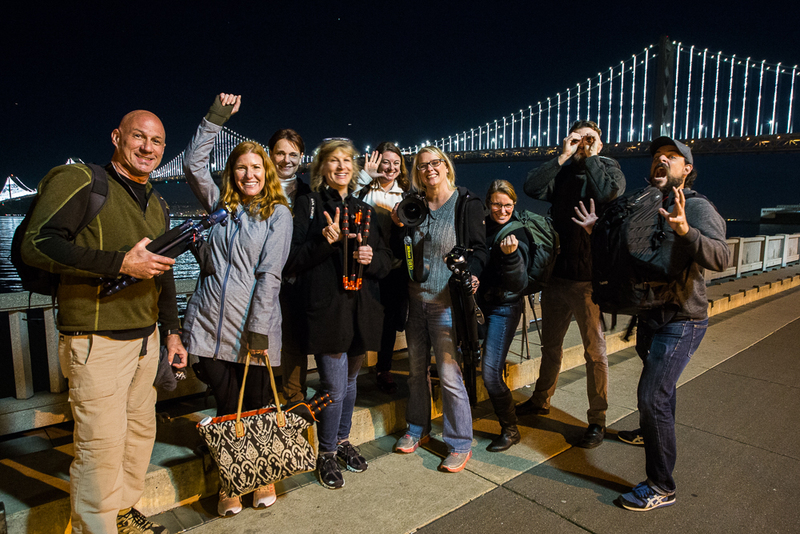 Though we had a smaller group tonight, there was no shortage of fun, or great image on their memory cards…we hope they are looking forward to the next adventure as we are. NOTE: You can see more workshop photos below the comments.